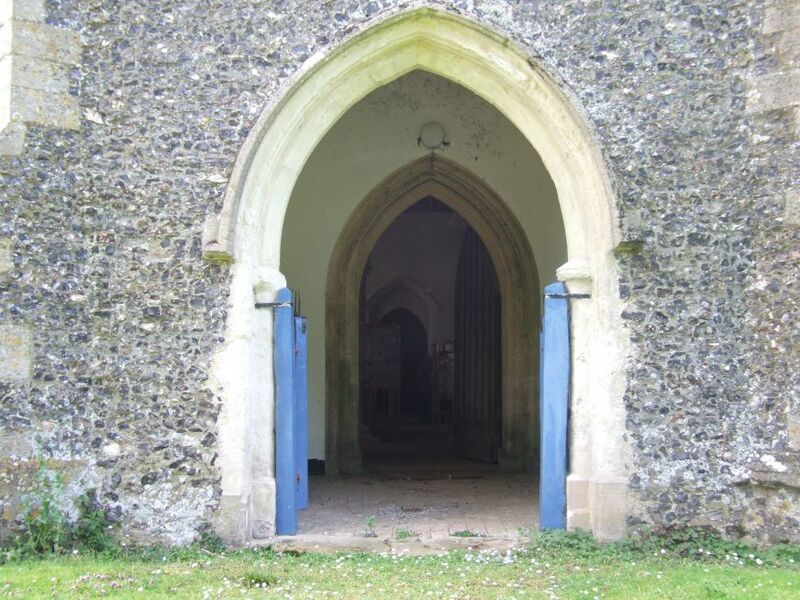 The Bradenhams form a joint parish in the mazy lanes between Dereham and Swaffham. 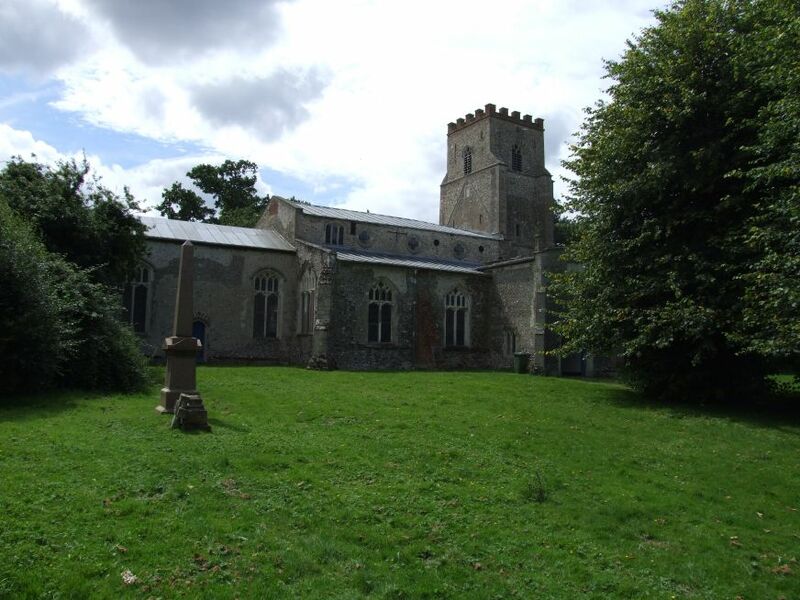 As late as 1973, a Rector was still being 'presented to the living' just to serve the two churches of this parish, and to live in the opulent Rectory opposite St Mary. What a life that must have been. 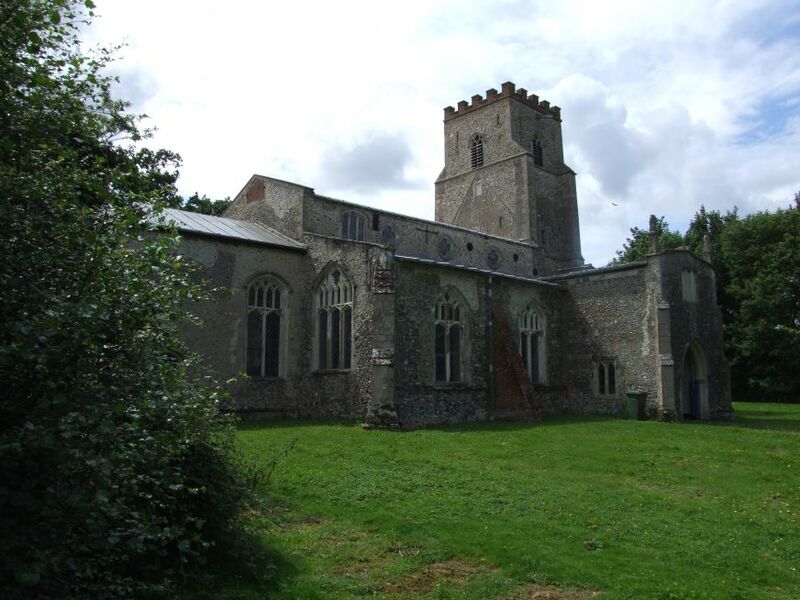 Today, as is the way of things, East Bradenham church is redundant, the Rectory has been sold off, and West Bradenham church is drawn into a joint ministry with half a dozen other churches. 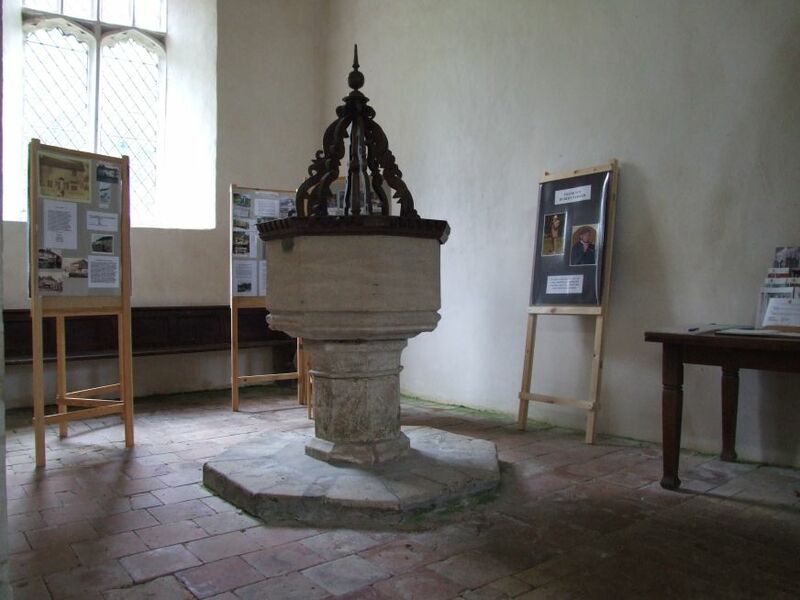 But the Churches Conservation Trust have care of St Mary, and so it is still looked after, is accessible, and is an adornment to its village. It sits out on the eastern edge of the Bradenhams, like a sentinel - or, at least, it would have been before the new houses were built immediately to the east. The aisles go right up to the western face of the tower, and the tower on this side is heavily buttressed, giving the building the appearance of a beast ready to pounce. Rather oddly, there are faint outlines of archways on three faces of the tower, which are very puzzling. There is something similar a few miles off at Holme Hale. 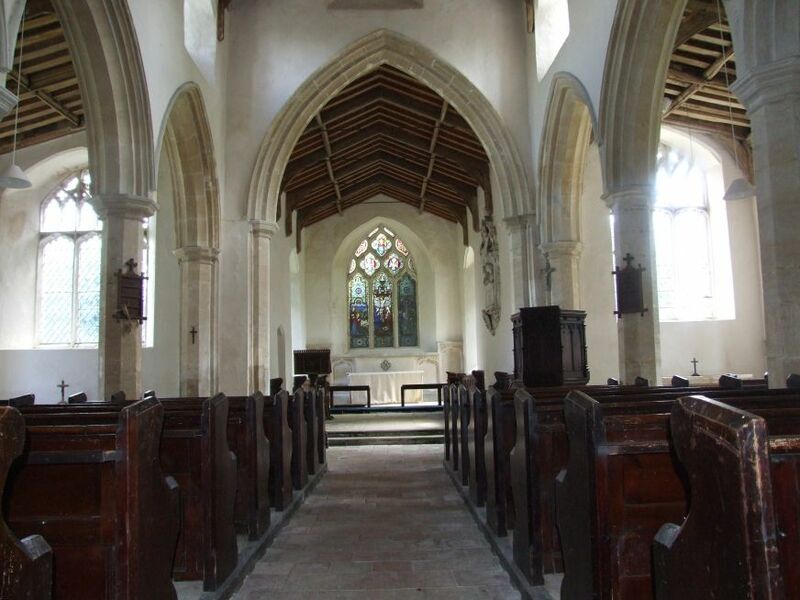 It suggests that, at one time, this was a cruciform church; but that surely cannot be - the aisles are older than the church. Unless, of course, what we see today was a refashioning of an older tower. 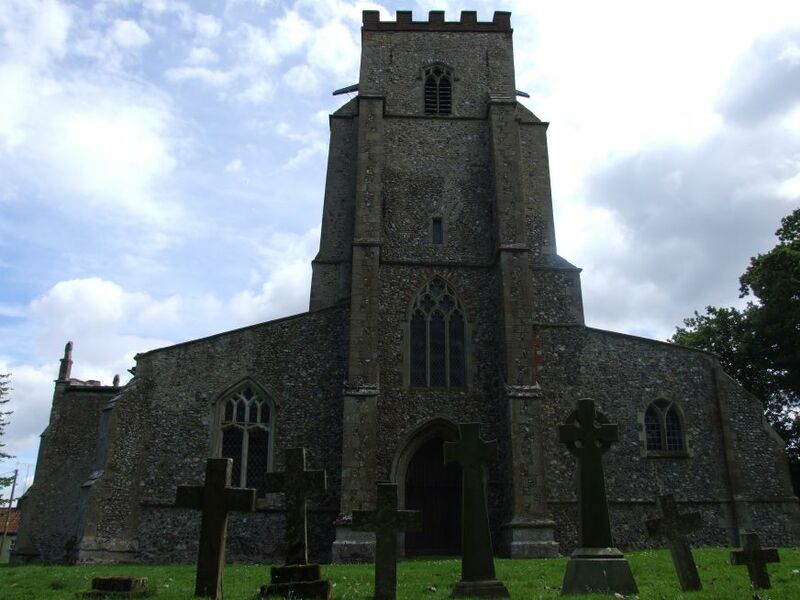 One of the most striking features of the setting - striking because, thank God, it is so unusual in East Anglia - is that the graveyard appears almost entirely empty of headstones. On closer inspection, however, you can see that they have all been laid flat, so that the grass has crept over them, and the rain and frost have eroded the inscriptions. This act of vandalism was a common solution in the 1970s to the problems of motor mowers unable to fit between the gravestones. Thankfully, it happened rarely in Norfolk (although thousands of older headstones in the county were removed and often destroyed so that the grass could be cut more efficiently). 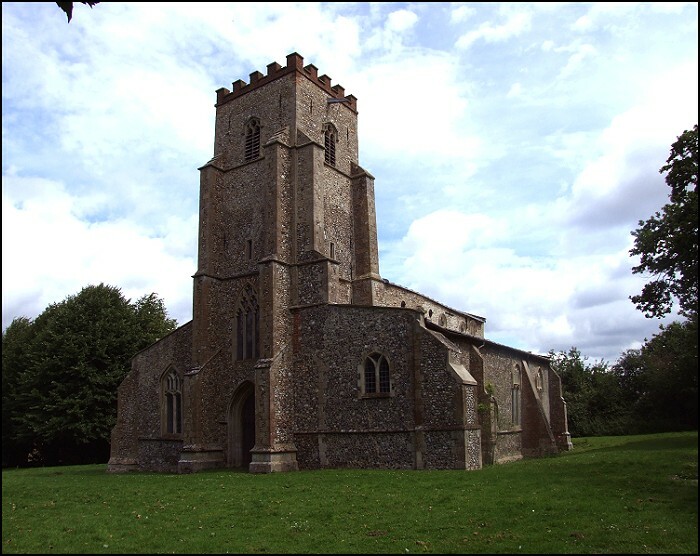 St Mary is a typical CCT church in that it has been cleared of old clutter, and allowed to be dusty in a kind of 18th century way. The brick pamment floors pass through elegant arcades under whitewashed walls, and the neat local carpentry of beamed roofs. The building is full of light from the clear glass in the nave windows. 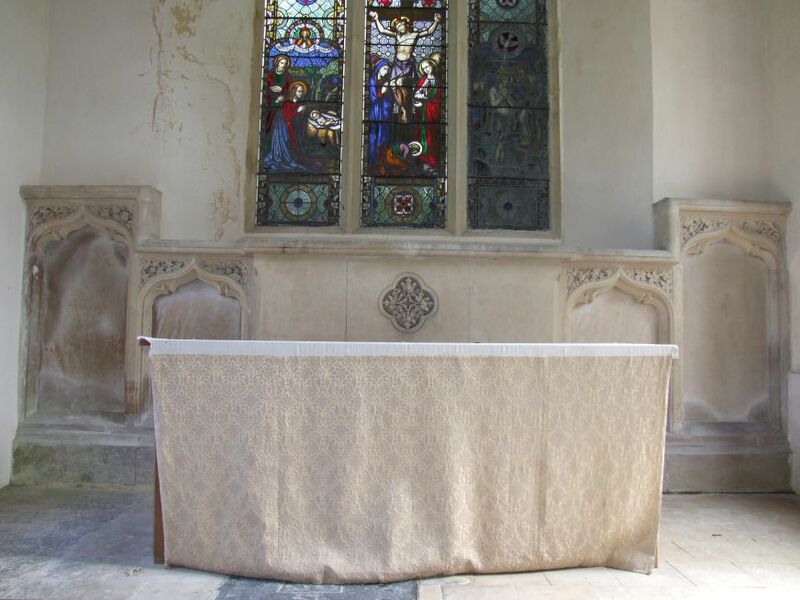 The only jarring note is the ugly 19th century furniture - how this building longs to be filled with 18th century box pews! At the end of the south aisle, the Stuart holy table is surmounted by a medieval stone mensa and a small 20th century crucifix - a delightful juxtaposition.There are two excellent memorials, almost a century apart. 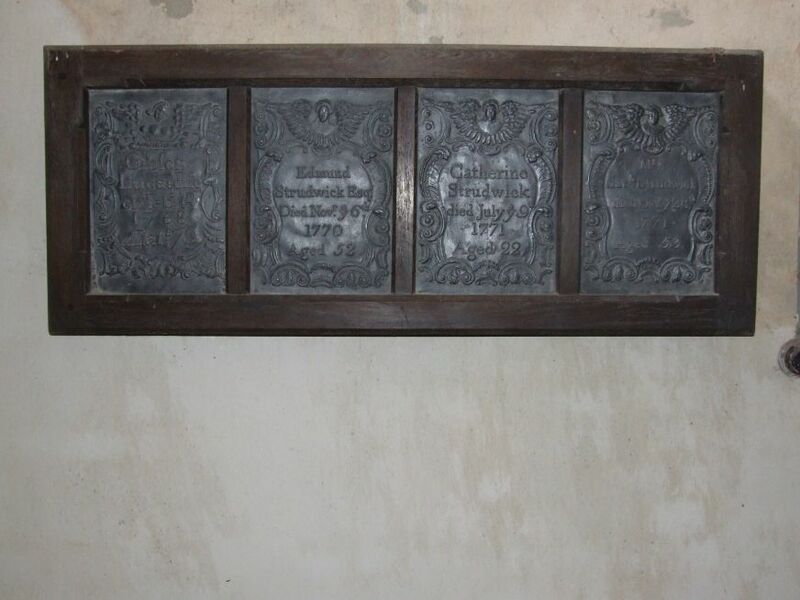 Up in the chancel is the 1684 monument to John Green and his wife, their busts lifesize above their inscription, curtains either side making it look for all the world as if they are sitting in a theatre box. 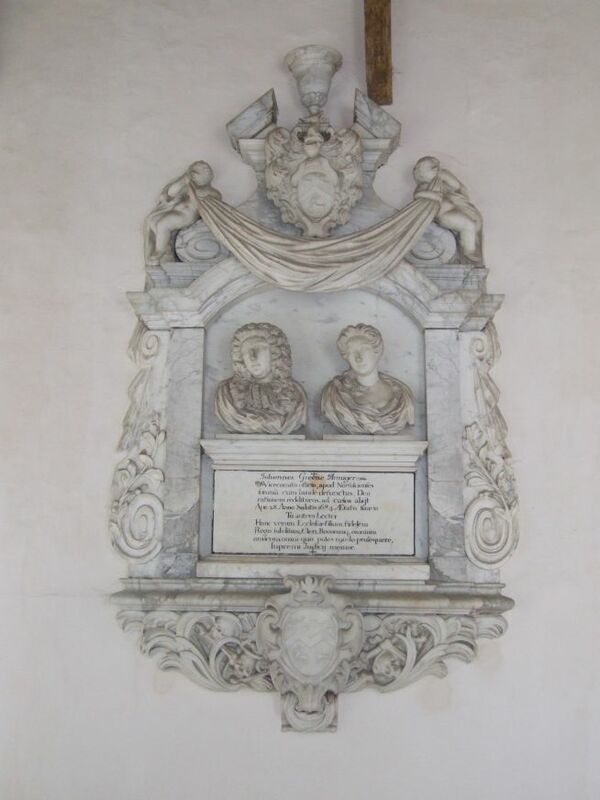 The 1750s Roccoco memorial in the south aisle to Gibson Lucas is more extravagant still, with a patterned marble surround and two thoughtful cherubs showing their grief at the bottom. The O'Connors were busy at the Bradenhams; but the bulk of their excellent glass is on the other side of the parish at West Bradenham. Here, their elegant crucifixion in the east window is somewhat obscured by ivy and elder outside. 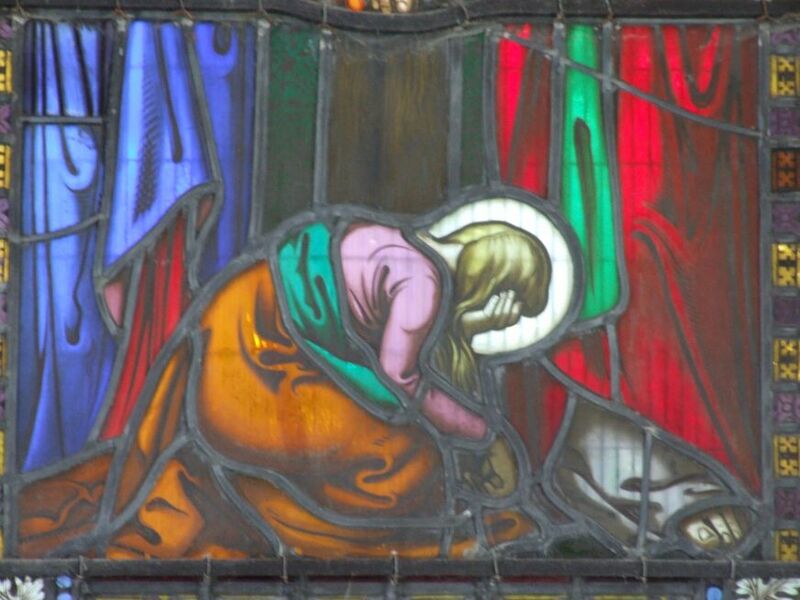 But the terrifying grief of Mary Magdalene at the foot of the cross is still plain to see.